Classic, no frills, pumpkin pie. I’m finally getting around to putting this recipe up and even though I made my own pie with absolutely no technical finesse (it’s these big clunky man hands), that doesn’t mean you can’t do something pretty with this simple recipe. As far as the taste goes, I was extremely pleased with how it turned out. The crust gets really crispy (maybe too crispy for some), which I like because it contrasts with the velvety texture of the pie filling. The filling itself has all of the classic fall pie spice flavors and a pretty good consistency throughout. Like many homemade pumpkin pies, you might get some cracking of the filling around the crust, but that’s only if the pie sits for a while. At Thanksgiving this year, I brought this pie over to a family friend’s house and they had a store-bought pie there as well. We turned dessert into an impromptu pie tasting contest and (regardless of whether people were paying me lip service or not) my pie won the day! No leftovers, other than a few crust crumbs, is a good sign that people liked it. I hope you do too. A whole pie is about 2375 calories. Makes 8 – 12 servings of 297 to 198 calories per slice. 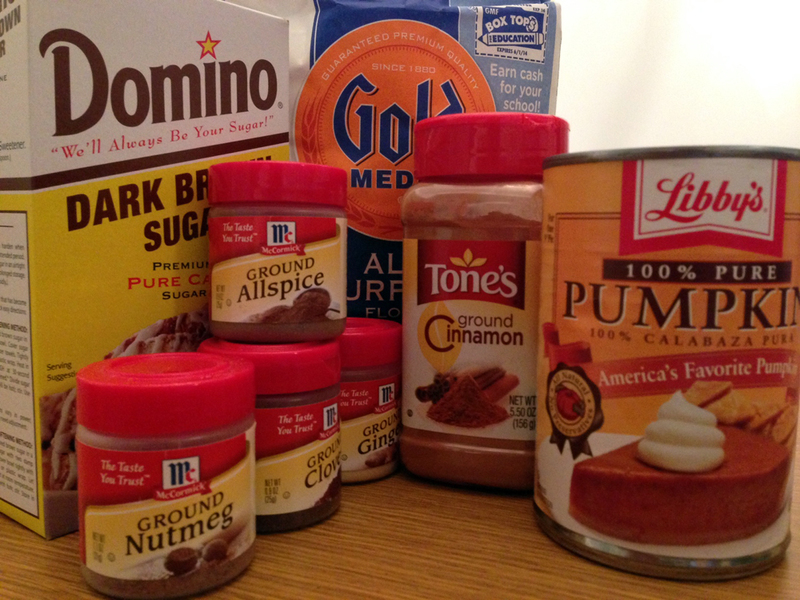 Optional: A little nutmeg for sprinkling on top of the pie when done. Note: If you don’t have a food processor then you can use a large bowl and a rubber spatula or hand mixer. Start by putting the flour into the food processor with the salt and white sugar before pulsing briefly just so everything mixes. 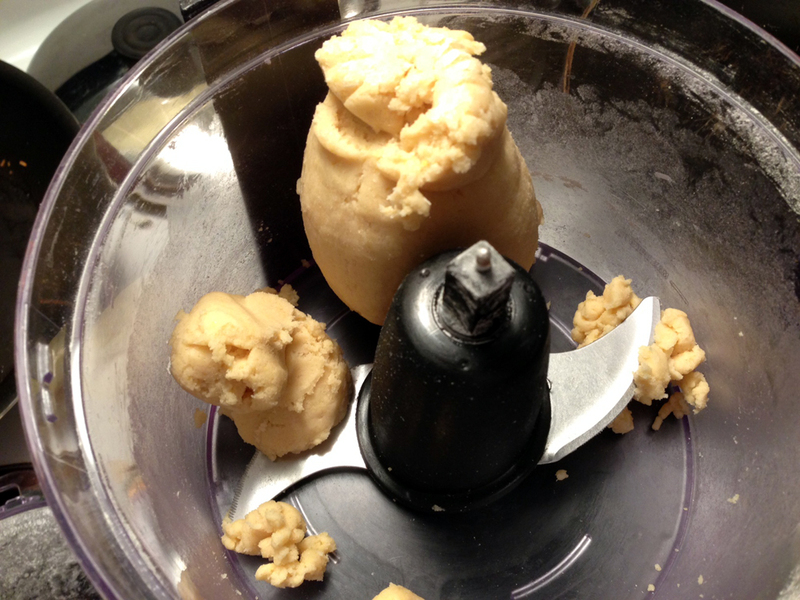 Cut up the butter into 1/2 inch cubes, add it into the food processor, and pulse until the butter is roughly blended, but it still has some chunks left. 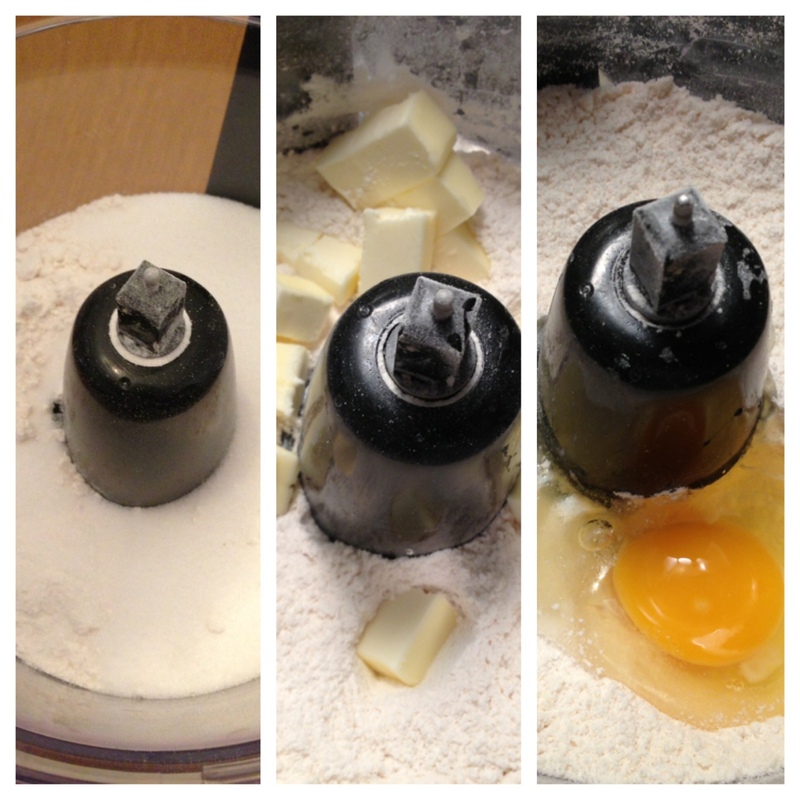 Lastly add in the egg with the ice-cold water and pulse until the dough just starts to become a ball. Right when it sort of rolls up on itself, stop the food processor. Tear off a piece of parchment paper and lay it down on a surface where you have some room. Then sprinkle some extra flour on the parchment sheet. Dump the dough out of the food processor and onto the parchment paper before collecting all of the pieces and molding them into a large ball or disc shape. Then sprinkle the whole piece of dough with a little flour as well. Next, use your hands to slowly stretch the dough out from the center in a circular shape to create a large flat disc that is about 13 inches in diameter. Note: I tried using a rolling pin, but it was a nightmare. Just use your hands. Dust the top of the dough with a little flour and tear off another piece of parchment paper to lay on top of the dough. Carefully place the dough (that is now sandwiched between the parchment paper) in the refrigerator for at least 45 minutes or in the freezer for at least 25 minutes. Note: This step is really important because it hardens the dough enough for you to manipulate it into a pie pan/dish. If you don’t cool the dough down, it will tear easily when you try to transfer it. After cooling the dough, take it out of the refrigerator and remove the top layer of parchment paper. Then carefully slide your hands underneath the dough between it and the parchment paper on the bottom to separate them. 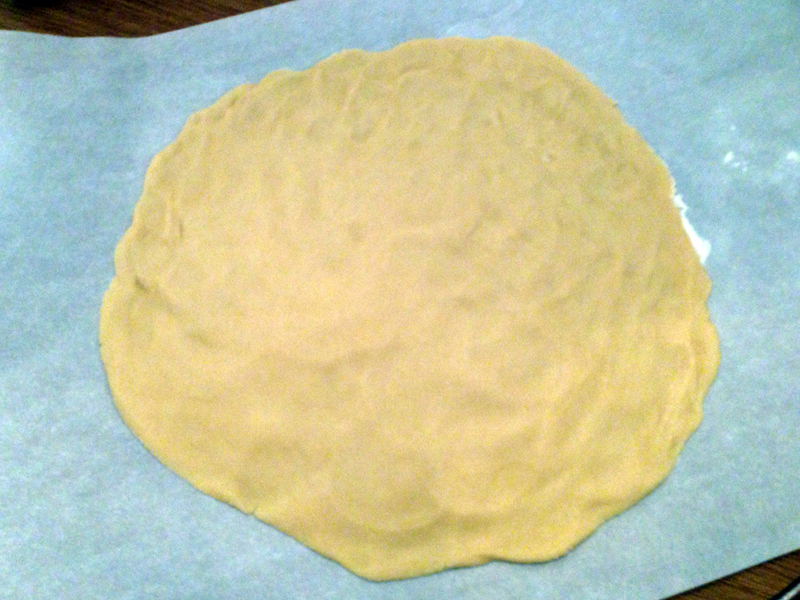 Lift the dough and place it immediately into the center of a 9 inch pie tin/plate. 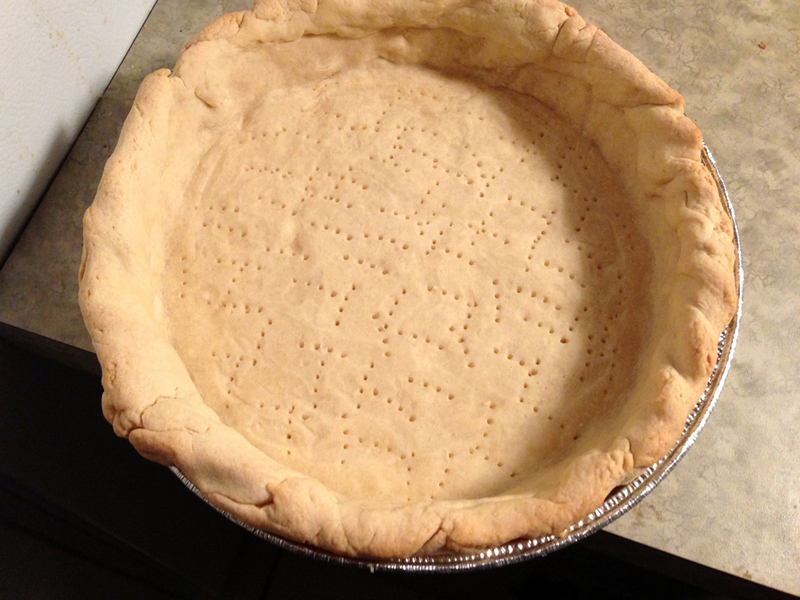 Slowly push the dough down into the pie tin so that it reaches the bottom and comes up the sides. You should have some extra dough hanging over the sides, so don’t worry about that. 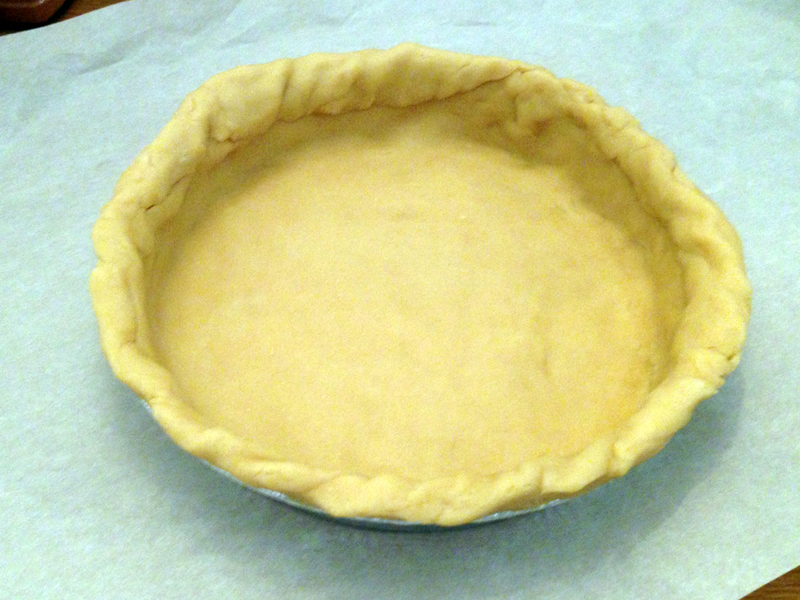 Fold the extra dough hanging over the edge of the pie tin onto itself to create a thicker crust. You can get fancy here and crimp the edges or create a pattern, but I just wanted to do it quickly, so I rolled the dough over itself in a semi-spiral. 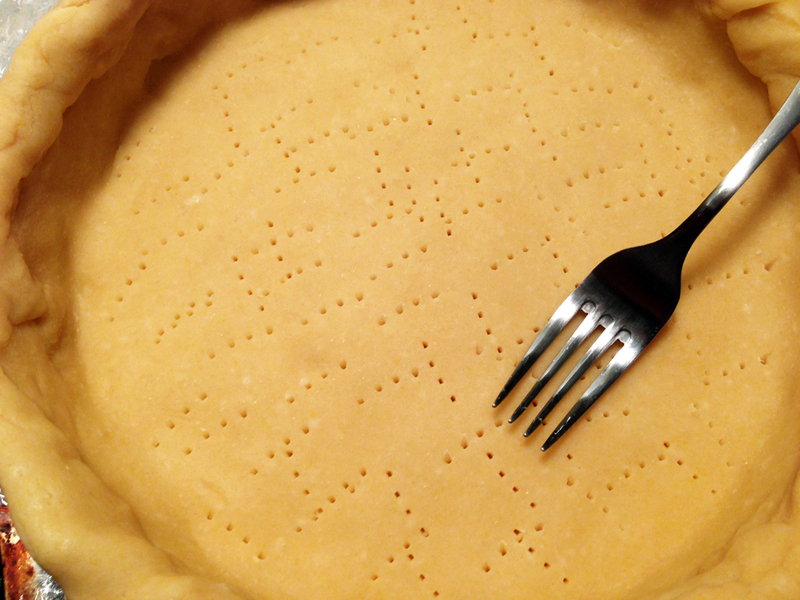 Using a fork, puncture the bottom of the pie crust to make a series of small holes. Next, place some aluminum foil just over the center of the pie crust and fill the bottom of the pie crust with either pie weights or dried beans to keep the bottom of the crust from rising during the baking process. I ran out of dried beans, so I just used a bag of lentils I had lying around. They worked perfectly well! Place the pie crust into the oven and pre-bake it for 20 minutes or until the edges just start to get golden. After 20 minutes, remove the pie weights or beans and aluminum foil from the pie crust and put the crust back in the oven for another 10-15 minutes until the while crust is golden. Now it’s time to make the filling, so open a 15 oz. 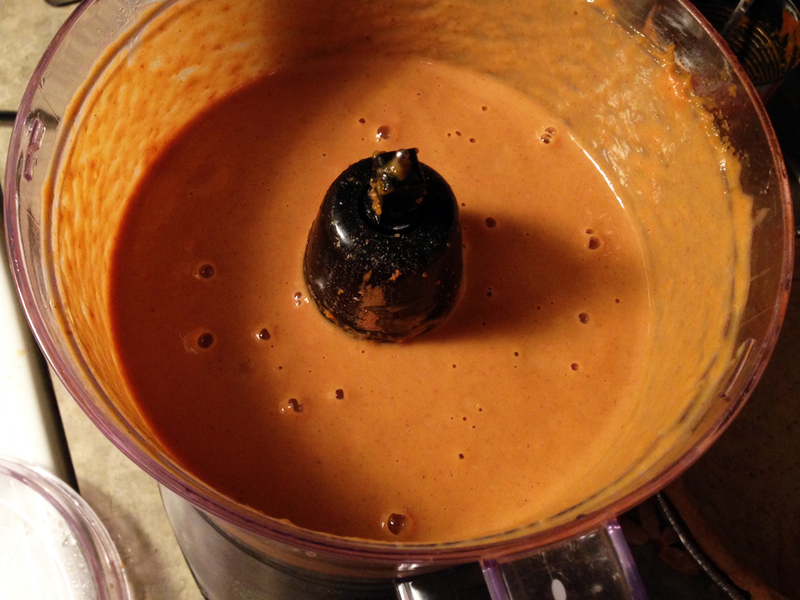 can of pumpkin and dump it into the food processor. 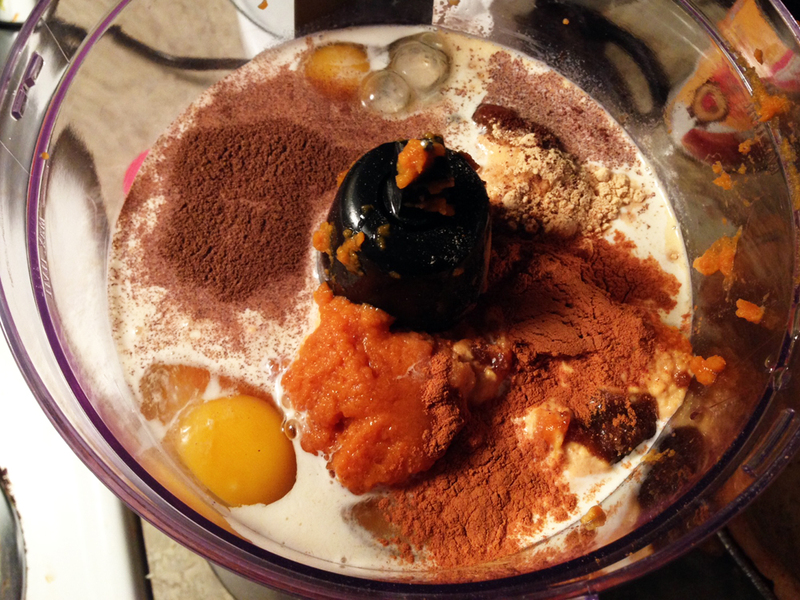 Add in the eggs, sugar, spices, and cream to the pumpkin as well. Pulse the ingredients together until they are well combined. Note: Don’t worry if the pie filling has the consistency of a thin milkshake because it will harden when it bakes. Pour the pie filling ingredients into the pie crust so that the filling reaches almost to the top of the crust, but not quite. Note: The filling will rise during baking and then come back down as the pie cools. Bake the pie for 1 hour to an hour and 15 minutes. Note: If the crust edge starts getting too dark, then cover the crust with some aluminum foil to finish baking. When done, set the pie aside to cool completely. The filling should be relatively solid, but have a little give like Jell-O. 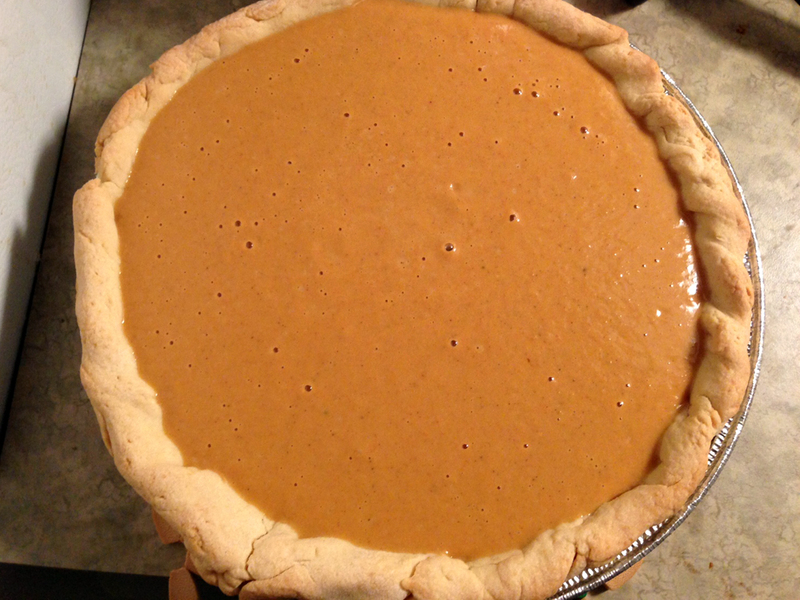 Once cooled, slice the pie and serve it with whipped cream and/or some fresh nutmeg sprinkled on top. Ignore the ugly pie crust edges that I mashed into shape haphazardly. It doesn’t affect the taste! Looks great. “Classic”…and the edges look fine…. Thanks! And yes, it is a classic. Sometimes simple is just what you need to get the job done. Hi Mary! Would love to hear your thoughts on the recipe! I will say that the pie crust recipe is not the best. It is serviceable, but there are better crusts out there. Just saying. The filling should be tasty though and if you cook it properly, I think you’ll be surprised that there won’t be much cracking. Enjoy!